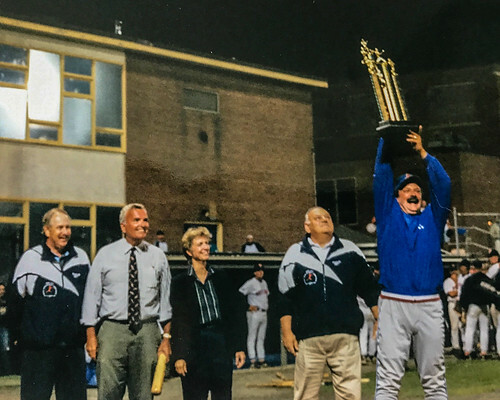 Led by CCBL Hall of Fame manager John Schiffner, the 1998 Chatham A’s were one of the best teams in Chatham baseball history. With a starting lineup that regularly featured four future Major Leaguers and a pitching staff starring three pitchers who would be selected in the first two rounds of the Draft, the A’s had star power. Yet Chatham was far from top heavy. The A’s were stacked with outstanding role players and complementary pieces that almost always seemed to come up clutch when their number was called upon. 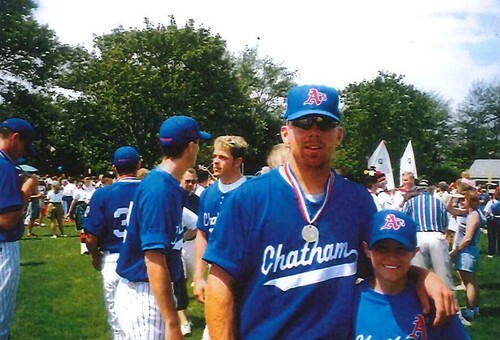 But, above all, the 1998 Chatham A’s were outstanding in a category numbers cannot quantify — team chemistry. Heading into the season, Schiffner and his staff knew they had a talented roster. But, much like teams on the Cape face today, Team USA played its part in team construction. Five players on the initial Chatham roster went to tryout with Team USA. “If they show up, the Chatham A’s are a super team,” Schiffner told The Cape Cod Chronicle in June 1998. Not all of the players who went to tryout ended up in Chatham. The two players who did were future major leaguers Kevin Mench (Delaware) and Brian Roberts (North Carolina). Mench and Roberts were roommates while trying out for Team USA in Tucson, Arizona. Mench — who said he has known Roberts since he was five — played in two games during the his time with Team USA while Roberts played in four games. Neither ended up on the roster. Roberts had decided that he did not want to play for Team USA and reported to the A’s instead. While Roberts and Mench roomed together with Team USA, the Chatham A’s were getting their season started with a matchup against the Harwich Mariners at Veterans Field on June 11. A harbinger of games to come, the A’s pulled off a late-inning comeback to start the campaign on a high note. Down 5-3 heading into the bottom of the ninth inning and with the bottom of the order coming to the plate, the odds were not on Chatham’s side. Jason Alcaraz (Michigan) started the inning with a single to right field and Clay Hooper (North Carolina) roped a double to right field. With runners on second and third, Matt Kata (Vanderbilt) scored Alcaraz with a ground ball. Doug Roper (Clemson) then attempted a suicide squeeze but failed to execute. Hooper was caught in no-man's land between third and home and was tagged out. Roper salvaged the at-bat by drawing a walk. After David Raymer (Sacramento City College) was plunked and Jon Palmieri (Wake Forest) hit an infield single, Chatham had the bases loaded for Matt Cepicky (Southwest Missouri State). Cepicky, for the first of many times that summer, left Veterans Field the hero as his single scored Roper and Raymer. During a trip to play a doubleheader in Falmouth, Chatham’s Kyle Snyder (North Carolina) and Falmouth’s Jeff Weaver (Fresno State) were both slated to pitch game two of the twin bill. Snyder was one of the top prospects for the 1999 MLB Draft while Weaver was a three-time All-American and had just been selected No. 14 overall in the 1998 Draft. After the game, Fincher remembers talking with Schiffner about Snyder’s impressive outing. Snyder — a 6’8” right-hander — would be given the Robert A. McNeese Award at the end of the season as the league’s most outstanding pro prospect. He finished the season with a 2.25 ERA and an opponent’s batting average of .189. But Snyder was not the only top prospect honing his craft with Schiffner, pitching coach Jon “Doc” Strauss and the A’s. CCBL Hall of Famer Rik Currier (Southern California) arrived later than most after winning the College World Series in Omaha with USC. But once he reported, he made his mark known. In his first of two CCBL seasons, the right-hander was 5-3 in eight starts, finishing with a 2.37 ERA and 33 strikeouts in addition to being selected for the All-Star Game. Jeremy Ward (Long Beach State) also came late to the team but immediately became one of the best pitchers in the league. Ward — who was one of the biggest jokesters on the team — made six starts on the season, finishing 5-0 with a 1.94 ERA. He was named to the East Division All-Star team and the End of the Season All-Star team. Mike MacDougal (Wake Forest) was the fourth top pitcher in the starting rotation. A future MLB All-Star as a closer, MacDougal’s pitches had a lot of movement, including a devastating fastball. The fifth starter in the rotation was Devon Nicholson (Sacramento City College). Nicholson had spent the spring at Sacramento City College and was transferring to play at Tennessee in 1999. While surefire studs from big-name programs fronted the rotation, a pitcher from a small Division III school in New Jersey that had only one former player make the majors led the bullpen. Stokes was not the only relief pitcher to carve out a role in the bullpen. Two-way player Ryan Earey (North Carolina) became an important set-up man and Todd Raithel (Louisville) made 15 appearances and saved five games for the A’s. 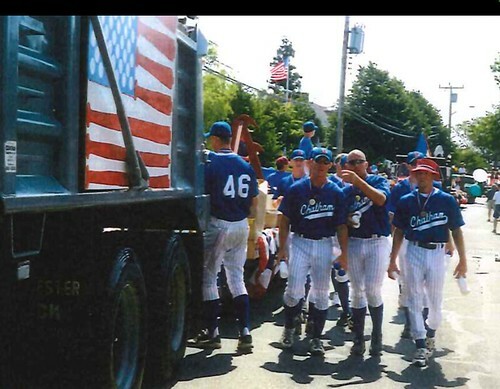 The Fourth of July on the Lower Cape always means a few things — hot weather, crowded streets, parades, fireworks and a baseball game between Chatham and Orleans. The summer of 1998 was no different. In front of a crowd so big Kata said he wanted to buy 50-50 tickets because the split was going to be “huge,” the two rivals put on a thrilling show that went down to the wire. The game between was knotted up in the ninth inning and Chatham had the bases loaded with Cepicky set to swing. Schiffner called over the power-hitting outfielder — a player he calls “arguably the strongest guy I've ever coached in my life” — to talk to him before stepping into the batter’s box. After giving him a quick pep talk, the A’s skipper knew the game was over. Cepicky stepped in and crushed the first pitch he saw deep over the wall in center field for the game-winning grand slam. Cepicky was the offensive juggernaut for the Anglers all summer. The left-handed slugger finished the season hitting .327 with team-highs in home runs with five, triples with three, hits with 53 and RBIs with 33. In batting practice and in games, Cepicky would hit bombs onto the hill in right field, onto Depot Road and even a few to the firehouse. Fincher remembers the lefty hitting the “most prodigious” home run — a missile that landed on Depot Road in straight away center field. While his moonshot on the Fourth of July sticks out, his magnum opus came on August 1 at Veterans Field during the All-Star Game. First, Cepicky went up against five other sluggers — including feature major leaguers Bobby Kielty (Brewster) and Jason Lane (Hyannis) — in the Home Run Hitting Contest and prevailed in front of approximately 4,500 fans. Cepicky, who hit homers that short hopped the firehouse, won the derby. Then, batting in the cleanup spot and right behind Kielty — who was named League MVP at the end of the year after hitting a league-high .384 — in the lineup, Cepicky continued to put on a clinic in the All-Star Game. In the top of the first, he started the scoring for the East Division with a single that scored Y-D’s Corey Slavik (Wake Forest). Five innings later with the game tied at one, Cepicky provided the game-winning run when he hit a sacrifice fly to center field, scoring Slavik. The East would tack on another run as they won the game 3-1. It was the first win in the All-Star Game for the East Division since 1991. For his efforts, the Southwest Missouri State product was named the East Division MVP, capping off a day for the ages. Cepicky was the not the only fearful bat in the lineup. Mench lined up right next to him in the order. The slugging right-hander came to the Cape after being named the Collegiate Baseball Player of the Year, hitting 33 home runs for the University of Delaware before showing off his picturesque swing at Veterans Field. It was not just Mench’s long home runs that stood out about the prodigious slugger. It was also his head. While Cepicky and Mench providing the pop in the middle of the order, Roberts and Kata set the table at the top and on the left side of the infield. In his second summer with the A’s, Schiffner promised Kata he would be the starting shortstop. But when Roberts arrived in Chatham, Kata slid over to third base. It was a sacrifice Kata, who stresses the importance of being a good teammate, was willing to do and did so without making a fuss. Roberts and Kata were both smooth defenders who easily impressed others with their defensive capabilities. Schiffner said watching Brian Roberts steal third base was fun to watch. The dugout did not know when he would break for third so Schiffner would watch with great fascination, trying to figure out when he was going take his first step and dash. But it was not just those four leading the offense. First baseman Jon Palmieri (Wake Forest) hit .307 with 21 runs in 42 games on his way to being named the first baseman on the End of the Season All-Star team. Outfielder Jason Alcarez (Michigan) had the highest batting average on the team at .333. Catcher Barry Gauch (Virginia Tech), Raymer, the starting center fielder, and Roper, the starting second baseman, all struggled at the dish but provided great defense and timely hitting for the team. In one game against the rival Cardinals in mid-July, Gauch provided one of the big highlights of the regular season. The Virginia Tech product launched a grand slam over the wall in left field in the ninth inning in an eventual 14-11 victory. As for Raymer, Mench remembers his outfield comrade being a solid outfielder. Early on in the season, the A’s dealt with a lot of weather-related trouble. One stretch in early June featured two fog outs in four days in addition to a sunset delay in Bourne a week later. During these fog delays, usually someone would pick up two baseballs and group of players would begin to play two-ball. Two-ball is a common pregame baseball activity involving a group of players. After the players circle up, one player will toss two baseballs in the air towards another, who has to catch both balls with one hand. That player will then toss the ball towards another. If a player drops one of the balls, he gets an out and the game goes until there is one player remaining. “We used to do that all the time, fog delays, before games — especially the pitchers — and just had a blast with it,” Nicholson said. Before games, Nicholson was the team barber. The right-hander had grown up cutting hair —his friends and his own — and had grown to be skillful in the art. Visitors to his host family’s house for a trim included Mench, who got a buzz cut, and Rathel, who preferred a fade. For Mench, his mornings consisted of working the Chatham A’s baseball camp with regular counselors Currier, Marc Desroches (Providence), Kata and MacDougal. Kata remembers excursions as elaborate as a road trip up to Provincetown on an off-day and also casual hangouts at the beach or at a house after games. The future big league infielder said that the players on the 1998 team truly cared about each other and that the team’s excellent dynamic was crucial to its success. After declining Team USA’s invitation, Roberts left from Chapel Hill with Snyder in a two-man caravan. Making the journey up to the Cape in his hand-me-down hunter green Jeep Cherokee, Roberts’ main source of entertainment was not the radio. In an era before cell phones were prevalent, the two Tar Heels had bought the “most powerful walkie-talkies” available to them so they could talk with each other during the long journey. The two Tar Heels, who lived together at UNC and had been good friends before the summer, lived in a house with first-time host mom Phyllis Shaw. Roberts said she was timid of the two ballplayers at first, but soon came to enjoy their company. While most players had full-time jobs, Roberts and Snyder did not. However, the two had plenty to do in the mornings to keep them busy. Snyder and Roberts used to drive a few times a week to Orleans to work out at a gym. On some days, they would do yard work around the Shaw household. Snyder said he and Roberts were always happy to do work around the house for Shaw because she had opened her home to them. After the summer in Chatham, Snyder and Roberts would never be teammates again. Roberts transferred to South Carolina for his junior season, while Snyder stayed in Chapel Hill. However, the two have remained very good friends, which made for uncomfortable situations when facing each other in the major leagues. The two were not the only two guys to stay close and keep in touch after leaving the Cape. During the winters, Roberts and Kata worked out together in Arizona. Cepicky and Snyder recently reconnected in Tampa. And it was not just with other players. Roberts and Snyder continued to keep in touch with Shaw for years and she even got see Roberts play at Fenway Park. 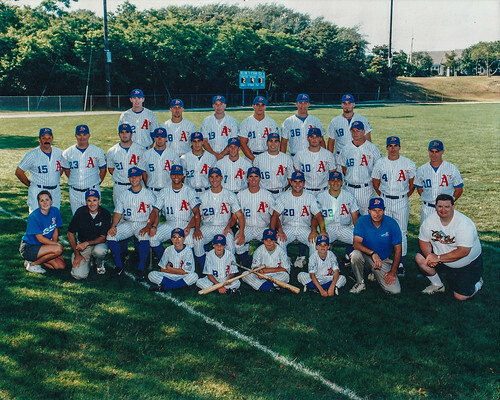 The A’s were the best team when playing at home in the CCBL in 1998. While taking the field in Chatham, the A’s were 16-5 in the regular season and then did not lose a playoff game at home. Even though the team was great at home, Veterans Field is not the ballfield it is today. When the players first arrived, the field was not in great condition. A winter and spring of wear-and-tear had done some harm to Veterans Field. Kata — who said he can close his eyes and see Veterans Field “perfectly” — recalls doing some work before the season began on the infield dirt. “The first two or three days it was here's a little bucket, walk around the infield and pick up all the rocks and stones from the dirt in the infield so we can get some better hops,” Kata said. Fincher and Strauss spent hours working on the playing surface. Strauss said Fincher made him mow the lawn every single day, while Fincher would spend hours picking up rocks all around the infield dirt and on the outfield-warning track. During the week, the two coaches led the baseball clinics. While one would supervise, the other coach would work on the field in preparation for that night’s game. For Fincher, Veterans Field is not like the playing surfaces he was used to in his native south. But, when he first set his eyes on the ballpark the summer before in 1997, he knew “right away how lucky” he was to be able to spend his time at the ballpark. The coaching staff was always the last group to leave Veterans Field after a home game. One night, the staff left the field and departed for The Deli — a restaurant located at the current spot of Sweet Tomatoes. The classic New York pizzeria and deli was an A’s go-to spot for years and was hosting that night’s post game meal. When the coaching staff walked in, the whole team was already chowing down slices and there was a pizza set aside for the skipper. “It was just sitting there waiting for me to attack it because I do love my pizza,” Schiffner said. Unbeknownst to Schiffner, the pizza was not a normal pie. The team had loaded the pie with Tabasco Sauce and Sriracha— there was more of the hot stuff than tomato sauce —in hopes of pranking their manager. Despite the taste, Schiffner downed one slice. Then, he ate a second and went for a third. The team was in shock. “Hey Billy, this stuff is great!” Schiffner yelled out to owner Billy Nickerson, who had a stunned look on his face. Schiffner downed five or six slices of the pizza to the bewilderment of the team. He turned the joke on its head. By the end of his meal, players were concerned for his health. One day, the players were talking about the playoffs and Schiffner was not about it. The team was on the outside looking in and not playing good baseball. Schiffner said if the A’s made the playoffs, he would get a tattoo. “First thing they did is they started grabbing me and going, ‘Where you gonna put it coach.’ ‘Where's it gonna go?’ ‘Where's it gonna go?’” Schiffner said. While the chemistry between the players on the team was excellent, so was the relationship between the players and the coaching staff. The A’s finished well down the stretch, but still needed a win on the last day of the season to clinch their playoff spot. Tied with the Harwich Mariners for second-place with 46 points, Chatham played Orleans at Eldredge Park while Harwich played the Brewster Whitecaps at Whitehouse Field. The A’s pulled off a come-from-behind 3-2 victory over the Cardinals, while the Whitecaps held off the Mariners, 5-3, to send the A’s to the postseason. Once again, Cepicky was the hero. With the score tied at two in the eighth, the All-Star singled home Roberts to give the A’s a 3-2 lead. On the mound, Currier threw seven innings, striking out seven and allowing only two hits. The win set up a matchup between the Whitecaps and the A’s. Brewster finished the regular season with the best record in the league and was led by Kielty, Mike Tonis (California) and future MLB All-Star Chase Utley (UCLA). Game 1 of the series was a 3-2 win for the A’s. After playing with two umpires for the first three and a half innings, Chatham came back from a 2-0 deficit with one run in the third and one run in the fourth. Mench broke the deadlock in the eighth inning with he beat out an RBI infield single. While Game 1 was a thrilling victory, Game 2 was even crazier. Jon Shirley (California), who was 8-1 on the season with a 2.22 ERA, pitched for the Whitecaps. He threw 7.2 scoreless innings of baseball. For the A’s, MacDougal put in a great performance as well. He threw eight innings and struck out 12 batters. However, he did make one mistake that Brewster pounced on. In the fifth, Lars Hansen (Hawaii) smacked a two-RBI double to put the Whitecaps up 2-0. In the ninth, Chatham managed to put together a rally. After the A’s scored one run early in the frame, Brian Peterson (Eastfield Community College) — a backup catcher who did not play a single game with the A’s all season — walked up to the plate. Peterson played for Harwich during the regular season, hitting .200 in 21 games, but signed with Chatham for the playoffs due to injuries. The backup catcher doubled into the right-field gap, tying the game and giving the 4,000 fans at Veterans Field a chance to watch more free baseball. The two East Division foes traded zeros for three and a half innings until the bottom of the 13th. Alcaraz singled and Gauch reached on an error, setting up Rayner. The center fielder hit .169 on the season with only three extra-base hits. Facing a 2-2 count, Raymer stroked a pitch deep onto the hill beyond the flagpole in center field, sending the Whitecaps players back to Brewster to begin their packing. The walk-off victory set the stage for A’s to face the Wareham Gatemen, headlined by the pitching trifecta of Phil Devey (Southwest Louisiana), Ben Sheets (Northeast Louisiana) and Barry Zito (La Pierce Junior College), in the CCBL finals. Devey was the co-winner of the B.F.C. Whitehouse Outstanding Pitcher Award, while Sheets and Zito would be drafted No. 9 and No. 10 overall in the 1999 MLB Draft and pitch a combined 25 seasons in the majors. The championship series between the A’s and the Gatemen was not the normal best two-out-of-three format. Instead, it was a three-out-of-five series. “We haven't had a playoff championship series ever since then go more than two out of three because, quite honestly, in the off-season when the league talked about that, we all said it's just too much for the players and the volunteers to do a five-game series,” current CCBL commissioner and former Chatham A’s executive Paul Galop said. Game 1 in Wareham did not go according to the A’s plan for the A’s. Snyder ran into trouble early in the game, giving up four runs in the first two innings. However, he recovered and, beginning in the fourth inning, retired 14 straight Gatemen. Chatham managed to tie the game in fifth but could not capitalize on its opportunities going forward. The A’s left 15 runners on base, including a bases loaded chance in the seventh. Pitching Game 2 for the A’s was Ward. Galop, who hosted Ward that summer, remembers how confident the right-hander was heading into the matchup. Ward helped the A’s bounce back in game two at Veterans Field. The right-handed pitcher went the full nine innings, striking out seven and retiring 17 of 18 batters at one point. Kata scored two runs while Palmieri scored a run and knocked in another as Chatham won 5-1, leveling the series. The best game of the playoffs, and one of the most memorable pitching duels in the history of the Cape Cod Baseball League, was Game 3 of the championship series. Future first-rounder Sheets went up against the future CCBL Hall of Famer Currier. Both right-handed pitchers traded zeros for innings. By the time the ninth inning was completed, neither pitcher had left the ball game nor allowed a run. Ben Sheets returned to the mound for a tenth inning while Schiffner told Currier his night was done after nine masterful innings. Sheets struck out 16 batters in his 11 innings, tied for the most in a CCBL playoff game. It was the second time all summer Sheets — who threw 125 pitches in the game — had punched out 16 batters in a 10-plus-inning performance. Even though both starters day’s were done by the middle of the eleventh, neither team was able to find a hero until the fourteenth inning, when Wareham was able to beat a throw at the plate to win the game 1-0. Nicholson said Currier’s performance is one that is likely to be overlooked because it came in a losing effort, and recalls the newspaper doing so the next day. The right-handed pitcher was not the only one who was confounded by the wording of the headline. With its backs against the wall, Chatham returned home for Game 4 and, in front of over 5,000 fans, fell behind 3-2 heading into the bottom of the eighth. Cepicky started the game-winning rally with a single to right and Mench followed that up by reaching on an error. Earey then knocked in Cepicky with a double and Gauch scored Mench on a single up to the middle to give the A’s a 4-3 lead. Wareham had a chance to retake the lead in the ninth. With two outs and the bases loaded, Barbier faced off against Stokes. The William Patterson product won the battle, forcing Barbier to fly out and sending the championship series to a winnter-take-all fifth game. Heading into Game 5, Chatham had used all four of its ace starters in the series, meaning it was Nicholson’s turn in the rotation, and he was going up against Zito. Despite the game being a mismatch on paper, the coaching staff was confident in Nicholson’s ability. “He's a guy I remember because he was at his best when it was most important and that's always a neat thing for an athlete,” Fincher said. Even with the confidence in their right-hander, the coaching staff knew that Zito would be a tough nut to crack. Earlier in the season, the southpaw had put in a dominant performance against the A’s. But, Strauss came up with an idea to get into the lanky left-hander’s head. Wareham’s manager was Don Reed, a CCBL Hall of Fame manager with four Cape League titles — 1989, 1990, 1994 and 1997 — under his belt. Strauss and the Chatham staff knew that he was a smart skipper. Strauss thought he might be able to predict what Reed might call. Calling out “turn on it” when he thought a fastball was coming and “stay back” when he thought a curveball was coming, Strauss was right “80-90%” of the time, Schiffner said. Even though Strauss was right more often than not, Schiffner told the hitters not to listen to Strauss. His educated guesses were strictly for the ears of Wareham. Strauss said he does not remember that strategy, but said he was able to pick-up one thing from the catcher that helped the A’s running game. “I do remember that we had something with the catcher that would indicate whether [Zito] was going to pitch or pick,” Strauss said. So while Nicholson was tossing zeros in the bottom half of innings, Zito was getting flustered in the top half of frames. He gave up two runs early on and was bounced in the middle of the fourth inning. Reed was ejected in the seventh for arguing balls and strikes. Nicholson threw 130 pitches in his best, and most crucial, performance for the A’s. He struck out eight while allowing only five hits and one run. Earey relieved Nicholson before handing the ball over to Stokes to close the game out. Extra insurance runs came in the eighth via Peterson. The “waiver-wire” pickup roped his second clutch double of the playoffs, this time a two-run two-bagger off the fence in left-center to make the score 5-1. Palmieri added a sixth run with a fielder’s choice later in the frame. As the ninth inning began and the inevitable seemed closer and closer, the players grew antsy. Less than two months before, Currier had dogpiled at Rosenblatt Stadium in Omaha. Now, he was trying to figure out the protocol for another championship victory. But there was one man who was not having it. Schiffner was trying to calm down the team, telling them there is still baseball to be played. After a certain point, Strauss was having none of it. Stokes was still on the mound and Strauss knew he had the game on ice. When Stokes recorded the final out, A’s players stormed the field and completed their dogpile, celebrating their championship. Schiffner received a Gatorade bucket of ice water to his back and soon lifted the trophy. There were two notable names that did not celebrate with the team after the game — Snyder and Ward. Both pitchers had left for home after their respective starts. Snyder wishes he did not. Cepicky finished off his memorable summer by going 12-for-36 in the championship series and winning Co-MVP with Earey. Earey made starts at third base and designated hitter and also came out of the bullpen in two games for the A’s. The celebration went well into the night. Fincher remembers eating great Italian food and Strauss recalls drinking Dom Pérignon for the first, and only, time in his life. Fincher said that the joy after the game was as happy as he has ever felt on a baseball field. But it was not just his happiness he recalls. In the dead of night, just hours removed from lifting the championship trophy in the middle of Clem Spillane Field, Kata and Alcaraz were not sleeping with their host families or celebrating the eternal glory with their teammates. The two CCBL champions were on the side of a highway, somewhere an hour and a half away from Wareham. Both players had only a few days before school began. Because they both were driving in the same direction — Kata was returning home to Cleveland while Alcaraz was heading back to Michigan — and wanted to get back home as quickly as possible due to quick turnarounds before school started, they decided to follow each other — much to each host parent’s chagrin. Kata waited with his teammate for a little while, but did not wait for AAA to show up. He had to return home and get ready to leave for school in a few days. So Kata drove off in his 1998 royal blue, two-door Mitsubishi Eclipse, listening to Bob Dylan and Bruce Springsteen on portable speakers because his radio jack was stolen at Vanderbilt earlier in the year. Some players left right from Wareham like Kata and Alcaraz. Others, like Nicholson, left in the coming days. The series-winning pitcher was on his way home the next day when he opened up a newspaper and was caught off guard by what he saw in the sports section. Seven players — Cepicky, Kata, MacDougal, Mench, Roberts, Snyder and relief pitcher Ronald Flores (Southern California) — on the 1998 Chatham A's did reach the major leagues. Together, they played over 50 seasons in the big leagues. Roberts and MacDougal made All-Star teams while Snyder won a World Series ring. Some of the players still work in baseball. Mench works in the Texas Rangers organization, Kata — whose 1998 championship ring is the only victory jewelry he owns —works with his hometown Cleveland Indians and Snyder is currently in his first season as the pitching coach for the Tampa Bay Rays. Schiffner — who did not get a tattoo until years after the campaign — coached 19 more seasons with the Anglers before retiring after the 2017 season as the CCBL all-time leader in wins. Fincher stayed on as an assistant coach until the 2007 season and is currently the head coach of USC-Upstate, where he has been the head coach for 21 seasons. Strauss left the A’s after the 1998 season and is currently the pitching coach at Baylor. 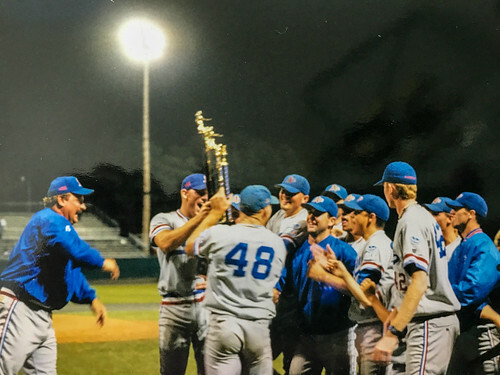 For Schiffner, who never won another CCBL title, it was not just the on-field performance that makes the 1998 team one of the best in team history, but the off-field success as well.